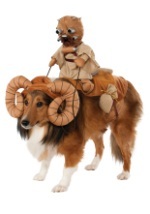 Outfit your dog with one of our Star Wars pet costumes. Choose from Darth Vader, Yoda and either the traditional or slave girl Princess Leia costumes. Your dog can have the pick of the litter! There will be no question what costume will cause the biggest stir at your next party with these various sized officially licensed Star Wars pet costumes.